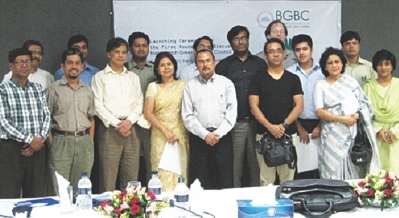 The launching event of Bangladesh Green Building Council (BGBC) was held at the Department of Architecture at the American International University-Bangladesh on July 5, 2011. It was followed by a roundtable forum for discussions and dinner. Renowned national and international architects, technology experts and researchers came together to decide the future of energy and environmental sustainability of Bangladesh and discussed solutions regarding pressing national and global issues. This forum included prominent national architects such as BGBC Events and Education Committee Co-Chair, Dr Saleh Uddin, the Head of the Department of Architecture at AIUB, who acted as co-convener, the Aga Khan Award for Architecture Nominee and green living expert, Rafiq Azam spoke at the event. Jalal Ahmed, the Secretary General of the Institute of Architects Bangladesh (IAB) talked about the adaptability of sustainable principles in the national architecture community. Selina Afroz, Additional Chief Architect of the Ministry of Housing and Public Works, Government of Bangladesh talked about the government's role in a National Green Building Initiative. Prominent Green Building Sustainable Design Expert, Architect and Assistant Professor of BUET Architecture, Sheikh Ahsan Ullah Majumder, the First Prize winner of the 2010 Holcim Green Built Competition for Sustainable Construction and BGBC Committee member was also present at the event. Internationally acclaimed eminent architect, Mustapha Khalid Palash, the Chairman of the BGBC Practicing Professionals Committee spoke about the sustainability standards of his renowned building, the Grameen Phone Head Office in Dhaka, which also won the 2010 Holcim Green Built Sustainable Design Competition. Dr Saiful Haque, Co-Chairperson of the Index, Tools and Technology Committee at BGBC, Dr Kamrun Nahar, prominent national Biofuels researcher and founding member of BGBC, Sloan Kulper, BGBC Advisory Board member and an internationally renowned social entrepreneur and Architect from MIT and current Vice President and Chief Design Officer of One Earth Designs, Inc., an international environmental technology firm, was also present at the event.